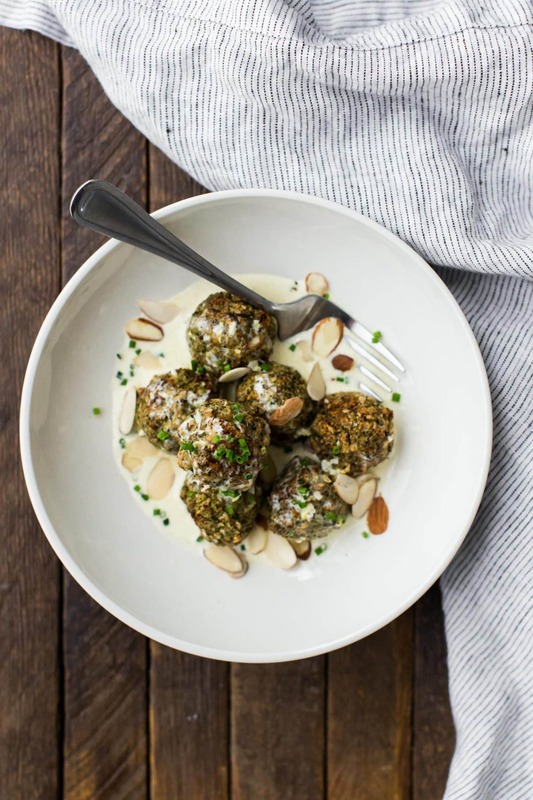 Lentil Broccoli Bites with Cream Sauce | Naturally. I’ve thought quite a bit about what I would serve if I ever open a restaurant (what I daydream about). 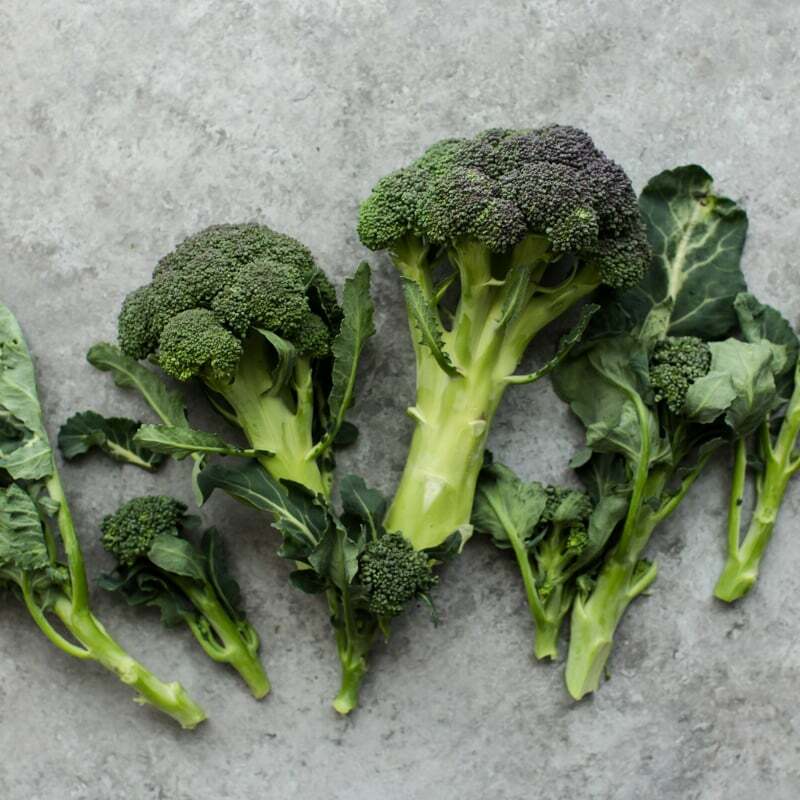 Recently, the first things that always comes to mind are these broccoli bites. 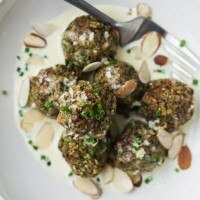 I make the base (these lentil bites) every other week with a variation based on what I’m making. Sandwiches, snacks, and a main course are just a few ways. These broccoli bites are a variation of which I’m particularly proud. 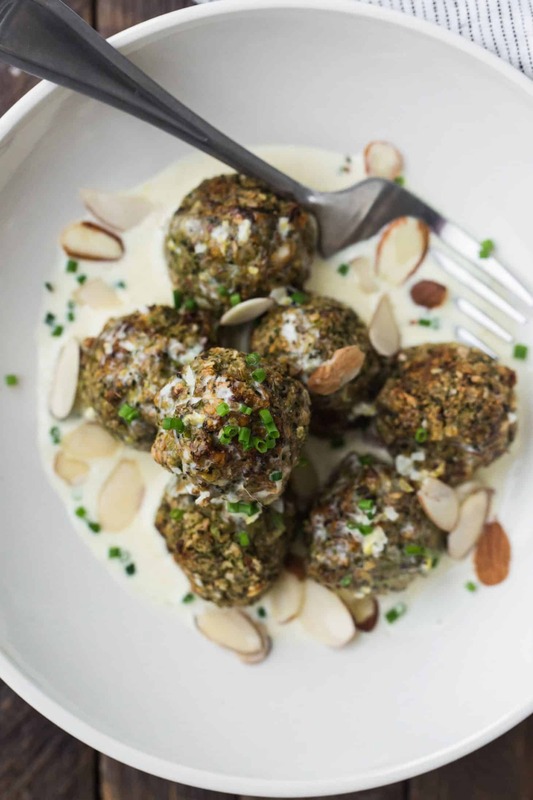 The broccoli and almonds are perfect with the lentils and the cream sauce turns this into a show-stopping, decadent meal. This would definitely be on my restaurant menu but for now, I’ll just share the recipe. Preheat oven to 425˚. Toss broccoli with onions, garlic, and olive oil and spread out in a single layer on a sheet tray covered with parchment. Roast broccoli until starting to char, 15 to 20 minutes. Transfer to a food processor and pulse into small pieces (no bigger than a lentil). Measure out about 1 cup. While broccoli is roasting, combine lentils and water in a medium pot. Bring to a boil, reduce to a simmer, and cook until lentils are tender, 23 to 25 minutes. If lentils are not tender and water has been absorbed, add more water and continue to cook. Drain off any excess water. In a food processor, combine the cooked lentils, broccoli mixture, nuts, panko, herbs, salt, and pepper. Pulse a few times to start combining the mixture. Crack the egg in and pulse a few more times until the mixture is combined but the lentils are still holding shape. Set aside and let rest while the oven preheats to 425˚. Take the lentil mixture and roll into 12 balls, roughly the size of a golfball. Place on a baking tray covered with parchment paper and brush with olive oil. Bake meatballs until browning and crisp, 25 to 30 minutes. While the lentil bites are cooking, make sauce. Heat olive oil over medium-low heat. Add garlic and cook for one minute. Measure in heavy cream and the 1 teaspoon of lemon zest. Bring the sauce to a boil and let cook until it thickens slightly, 6 to 8 minutes. Stir in lemon juice at the end. Divide the lentil bites into two bowls and drizzle sauce on top. + Lemon Cream Sauce lightly adapted from Martha Stewart. One of the reasons I love this recipe so much is because of how easy it is to adapt for different dietary needs. It’s a solid dinner, especially when paired with a side salad or grain dish. Cauliflower: Swap out the broccoli for roasted cauliflower. Not as colorful but still good! That cream sauce looks amazing. You’re the best! How’s the texture on the broccoli bites? Could they be replaced as regular falafel in a roll, or bread, you think? Potentially- they crumble a bit easier than the falafel which is why I like having sauce with them. It’s worth a shot! I will give these a try, mainly because you like them so much. If you open your restaurant you have to serve your turmeric rice and kale with coconut milk. I made that again last night. I eat all the kale by myself. Delicious. Great recipe that opens up a lot of room for experimentation! But I am especially enamoured with your new design. A great look that really fits the theme. Looks wonderful! Do you have nutritional info available? This looks yummy. I will be trying these. Erin, I tried this recipe over the weekend. For the sauce, I was pressed for time and simply added lemon juice and lemon zest to greek yogurt and whisked it to give it a creamier texture. I also made the pea pot stickers and cucumber salad with coconut milk dressing I found somewhere on your site. And I usually don’t cook or attempt other blogger’s recipes. Yours are easy to follow, healthy, and I have most of the ingredients laying at home. Since becoming a vegetarian, I have to admit I often miss homemade meatballs. This recipe offers a delicious alternative and really hit the spot for my husband and I. Great dish! Do you think cooked chickpeas could be substituted for the lentils? I think so- the texture with be a bit softer before cooking but I think it would work just fine.